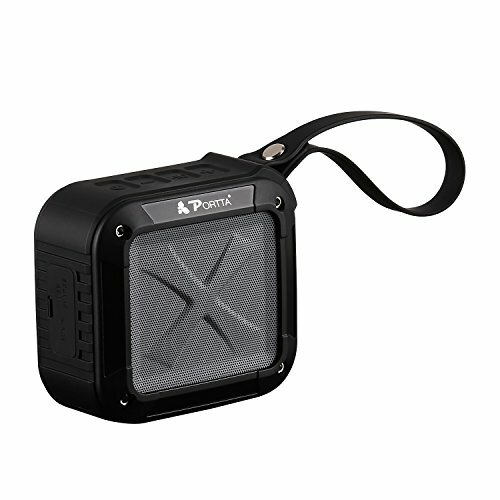 Key Features of PORTTA Waterproof Portable Bluetooth Speaker - Hi-F and loud stereo sound, powerful bass - Waterproof IPX6, Shockproof, Dust proof - Built-in Microphone for hands-free speakerphone call - NFC function, Micro SD/TF Card Port 】 - 1500mAh battery for up to 12 hours of playtime Perfect On-the-Go Speaker Weighs only 9.5 ounces and just 3.9 inches long. Comes with a silicone lanyard. Fits easily into your pocket, backpack, purse, suitcase or travel bag. High Quality Music Everywhere Enjoy crystal clear, bass rich music while hiking, camping, picnicking, fishing, on the beach, by the pool, in the shower, at home, in your office, Anywhere! Without worrying that water, sand or dust could do any damage to your speaker Waterproof Design Rated waterproof level IPX6, it can resist low to medium pressure water splash from any angle. Not submersible but can withstand accidental drop in water. Dry before use if submerged in water accidentally. Guaranteed safe use in the shower, in the rain, by the pool or on a boat. Stronger bass and higher quality sound. Perfect for Outdoor Sports, Travel, Bicycle/Bike, Cycling, Climbing, Camping, Hiking, Running, Fishing Use. Quick& easy to pair Our Bluetooth shower speaker & outdoor speaker uses Bluetooth 4.1 technology, so it pairs with portable devices much more quickly than other portable Bluetooth speakers. It has a high capacity battery that can provide up to 12 hours of endless music, outdoor model can be recharged in just 5 hours with the included Micro USB cable. Use the water-resistant Bluetooth speaker to stream music from an iPhone or Android smartphone, an iPad or Android tablet, an iPod Touch or even a computer or laptop with Bluetooth. Our Bluetooth Speakers Waterproof, but should withstand accidental drop in water. Guarantees that it will stay safe in the shower, in the rain, by the pool or on a boat . If you have any questions about this product by Portta, contact us by completing and submitting the form below. If you are looking for a specif part number, please include it with your message.